It’s a long hockey season. There are many points where you might want to drop a marker of some type–a bread crumb if you will–to retrace the story of the particular club. You could drop many so far this season: When Carter Hart got called up, when AHL MVP Phil Varone got called up, when Bardreau and Kaše got injured, when Aube-Kubel was lost (for the year? ), when Leier was traded for Bailey, and so on. Sometimes those markers can turn out to be huge turning points–for better or worse. Sometimes, like recently when I postulated that the 10 games leading up to the All Star break would be a portent to the second half of the season, it doesn’t exactly turn out that way. With the 4-1 loss last night in Bridgeport to snap a six-game point streak, the Phantoms ended with 10 of a possible 20 points in those 10 games–exactly half, .500. The standings look almost the same as they did before what I thought was a key period. Nothing really happened, season-wise. Here we are again. We’re again at a crossroads where the season can take a turn–or continue on its current trajectory. The Hamilton Street Heroes are in third place in the AHL Atlantic, just one game behind Bridgeport and two points ahead of Providence in the division’s “playoff” bracket. Challengers such as Springfield and Wilkes-Barre are within four points. Dark horses Hershey and Hartford are within ten points. And of course, first place Charlotte shows no sign of slowing down with a commanding 12-point lead over second place. We’re at the All Star break–a natural spot to drop a pin, anyway, representing the half-way point in the season even if it’s not mathematically so. It seems like the Flyers are perhaps thinking this way, as well: There are signs that the Flyers under new player management will want to see what they have in their AHL prospects and how they’ll play on the NHL stage. In second-to-last place in the Metropolitan Division, the Flyers are certainly in position to look towards the future rather than continue to beat a dead MacDonald in hopes of another one-round playoff bid. Before trades can be made, and before massive waivers can be considered, the big team needs to know what it really has–and how it fits going forward. It started last night. While we expected that goalie phenom Carter Hart would return to the Flyers following his spot start in Bridgeport, we also learned that F Misha Vorobyev would be returning to the Flyers again following his early-season banishment by the former Flyers regime. Whispers suggest that more moves could be forthcoming: Defencemen Phil Myers and Mark Friedman perhaps? Forwards Tyrell Goulbourne and Mike Vecchione? Maybe Forwards Greg Carey or Justin Bailey? And that doesn’t even factor in trades. If the Flyers become active in the trade market, other players could be moved from the Phantoms roster–either to other teams or to the Flyers to replace jettisoned veterans. I’m thinking of the younger guys like Connor Bunnaman and Carsen Twarynski, as well as injured guys like German Rubtsov and David Kaše. Probably not likely, but everything seems to be possible now. “Down to the crossroads, fell down on my knees. But the Flyers can’t just take all our players, right? (Um, right?!?) So where will the players come from, who will join the lines and pairings following this “Crossroads” in the Phantoms’ season? The first of the waiver moves began a week or two ago when the Flyers put Forward Dale Weise on the list. He passed through unclaimed, but was not sent immediately to the Phantoms. Sure, he could have helped with the recent missed time from the likes of Carey, Kaše, Goulbourne, NAK, Misha, Rubtsov, Fazleev…. But, no, the Flyers decided they’d leave Dale in Voorhees and not even take him on their recent road trip. Finally today, he was assigned to the Phantoms to make room for Vorobyev on the Flyers. F Phil Varone: He’s had good reports from his return-trip to the NHL. I’m certainly not the guy to say he doesn’t deserve to stay there. However, you have to ask if he’s part of the Flyers future plans. Because that’s what this is really about now. Remember what happened to Jordan Weal? Taylor Leier? Danick Martel, for that matter? F Corban Knight: Knighter made the NHL club out of the preseason with his ability to play bottom-six-style hockey, as well as his ability to kill penalties. He’s a very versatile player who can help a hockey club in many ways, and the Flyers recognized that. He’s also injured. With the new regime in place, and Corban getting healthier, I’d expect to see him on the move in some way or another. My previous opinion was that we’d see him on a 14-day “conditioning” assignment following the All Star break, if he was deemed healthy. With the way things are going, he could also just immediately be placed on waivers. However, either way he has to be on the active roster, so that’s the move you need to look for first–and as I peek at the NHL roster, I don’t see an ‘IR’ designation next to his name. (Disclaimer: I’m a big Corban Knight fan, so take my Knighter views with a grain of salt.) One way or another, I hope to see him soon. D Andrew MacDonald: AMac certainly hasn’t been a popular figure in Philadelphia, but he did play well for us a couple seasons ago. His contract is such that if he were to be placed on waivers, he’d likely go unclaimed–just like he did two seasons ago. If the Flyers want to take Myers and Friedman for a spin in the NHL, here’s one place where they can make room. His salary is likely also a detriment to any kind of trade scenario involving him. I’m not sure if there’s any other defenceman they want to risk losing right now, but if they deem that the future isn’t likely and there’s no trade market? Yeah, I suppose you could see a Folin or a Gudas waived, but I would think they’d get claimed as depth pieces for another club and would be unlikely to ever appear as Phantoms. Goalies: This might be the next move you see. The Flyers currently have three active goalies on their roster–Hart, Stolarz and McKenna–with veterans Elliott and Neuvirth in IR. Assuming we stay true to the Flyers’ “future mode” then Carter Hart should remain the primary NHL goaltender going forward. They won’t work him to the ground, so a second goalie will not only be necessary but should be dependable as well. The first step will be for the Flyers to find out what they have in Anthonly Stolarz. Following a series of injuries, he’s once again healthy and he’ll have an NHL opportunity or two in the coming days/weeks. If the Flyers see a role for him, then expect veteran McKenna to see the waiver wire. As a Phantoms fan, I would have to hope that he’d pass through. 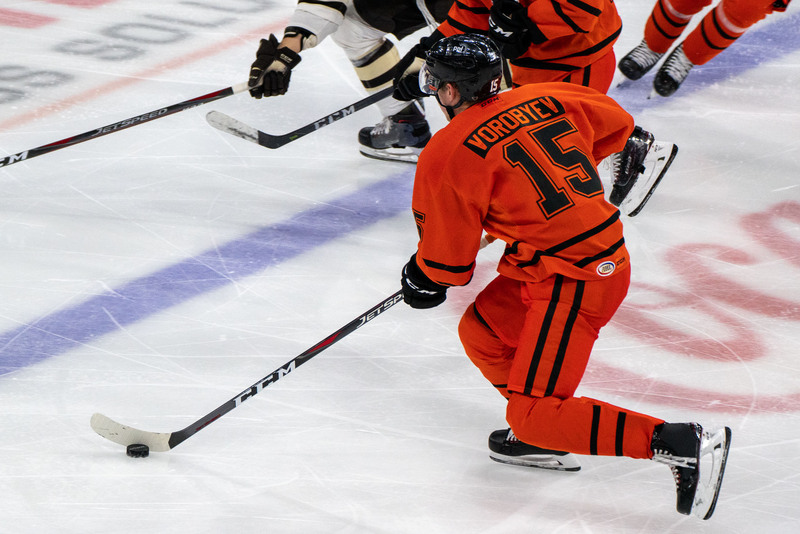 As much as I’m happy with Alex Lyon, his recent injury (thought to be minor, but there’s really no official word–of course) underlines the need for a second proven puck tamer in Allentown. Everything’s on the table, though, so a trade or another Stolie move could happen as well. Elliott has been practicing, so you’d have to think he would be activated (conditioning assignment?) and a decision would have to be made there as well–waiver versus trade. I would think a team with designs on the playoffs might pick him up for veteran depth should he hit the wire. It’s not clear how healthy Neuvirth is or how long he’d be able to maintain it. However, I think I’d put him in the same category as Elliott: Clearly no future with the Flyers, and no chance he’d pass through waivers to the Phantoms either. So, Phantoms goalie help will likely come from Stolarz, McKenna, or something from the next options. This won’t come until later, but with the new management regime in place, I would have to think they’d like to get an in-person look at some of the younger prospects. The Phantoms could see some ATO’s from Juniors if the conditions are right (Junior season over, etc.) or PTO’s from College signings from guys not returning to school. Some overseas players could arrive as well. Sometimes these guys do great, coming in with rhythm from their primary season and with hunger to compete and prove themselves. Other times, they could take time to assimilate into the Phantoms systems among the more established players. Still, if the team is indeed already in the playoff hunt and a player or two fits in, it could be a help in the tournament. Now is not the time to speculate on who and when. Plus, if the team folds early in the “second half” here, it all becomes pretty moot and but a nice distraction down the stretch of a disappointing season. So we’ll save that part for later. The trade route works both ways. Players in return for veterans could be AHL-level players who need a change of scenery (see also: Bailey) or prospect in their first season of the AHL who aren’t ready for immediate promotion. Just a vague example from the top of my head: Let’s say a veteran defenceman from the Flyers gets traded, to make room for Friedman and/or Myers. The trade returns could very well include a first-year AHL player who would join the Phantoms and contribute to our season right now. AHL trades could be made, too, but would be along the lines of Leier/Bailey and wouldn’t likely net us additional players. 4. Injury. Well, injury taketh away, it might be time for some give-back. It’s hard to say coming from an organization that is so tight-lipped about injury status and medical, but at some point we presume to get F David Kaše back. D Sam Morin might make a few starts during a conditioning stint soon, but would have to pass through waivers (doubtful he’d make it) to be assigned to the Phantoms. Longer term Cole Bardreau should be back, and although I highly doubt it, Nic Aube-Kubel has not been officially announced as out for the season, so I suppose there’s a chance he could return. There are still a couple guys in Reading who might deserve an AHL look, but we already have a bunch of call-ups on board–and holding their own–so I don’t look at this as an area for the Phantoms club to improve. However, guys like McCarthy, Goumas, and Luukko could still appear. Komm did well the other night in the win over Laval. Like at some points in previous seasons, the Phantoms could go out shopping on the ECHL rosters and look to bring in players who might fit and contribute. This is not likely to be the key to our season, but there is the chance there’s a guy or two out there, not on an AHL contract, who could come in and play well. So buckle up. It could be a bumpy ride. The blog will be here to guide you along the way, and tune in on social media for immediate reactions as necessary. Twitter @Kram207, and Facebook within the Phantoms Season Ticket Holder group, as well as “Holy Puck” and “Phantoms AHL Hockey Phanatics” groups–and with the occasional cool hockey photo on Insta: Kram209. It feels like there’s enough talent around for the Phantoms as a club to remain competitive in the challenging AHL Atlantic for the 2018-19 season. However, you can see how there might be some dark times ahead; hopefully, we can ride them out. PS: Cross Road Blues was written and recorded by Robert Johnson in 1936. The lyrics above were sampled from a version of the song titled Crossroads and recorded on the album “Wheels of Fire” by Cream in 1968. I’ve included them in this piece for educational purposes only. I think one of your random contributors predicted way back (Jan 9) that the team would play .500 up to the All-Star break. Morin would not need to clear waivers to be assigned to the Phantoms on a conditioning stint. Obviously, it would be temporary and the duration depends on certain conditions and league approval for longer than the 2-3 game variety. Considering the severity of the injury and length of time missed, it is quite possible that an extension of the conditioning assignment would be approved by the NHL if the Flyers appeal for that. The plan, since early January, has been for him to report for the Utica weekend. I have seen no reports of a setback, so I am assuming that 2/8 is still in the cards. The other thing about Morin is that he would have to be on the Flyers active roster prior to the conditioning assignment. I see no reason why he wouldn’t get the standard 14 days, and fit as many games in as possible. However, with Ghost now nicked up and possibly the need for Myers to get called up, things might be in flux a bit. McKenna, of course, is now with us on conditioning, which could take him through next weekend. One possible place for a roster spot is for Philly to waive McKenna–but that would risk losing him. Strong play by Carter and Stolie makes it likely, though. And no word on the health of Lyon, so there’s that, too. Plenty for a fan to chew on.